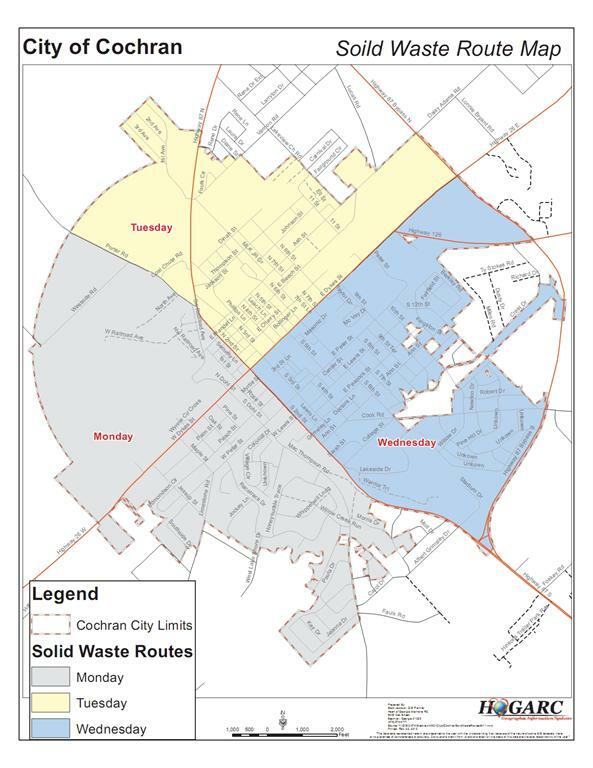 Public Works in the City of Cochran is entrusted with providing utility services to over 4,850 residents and over 100 businesses. Public Works encompasses the Street, Water, Sewer, Waste Water Treatment, Solid Waste and Gas Departments. A team of 18 trained and committed employees maintains our facilities and systems to ensure customer satisfaction and provide public service that emphasizes strategic planning in the best interest of the community. The Street Department is responsible for the repair and maintenance of over 52 miles of roads within the city limits. Roads are continuously inspected and repaired each month using hot mix asphalt and/or cold patch blacktop to provide a safe roadway for motorists. Water to the City of Cochran is obtained from four deep water wells that are strategically positioned throughout the City. Annually, over 280,000,000 gallons of water are distributed to area residents and businesses through 62 miles of water lines. Department employees routinely read, inspect, and repair water meters; repair city water lines; and test water supplies to ensure a reliable, clean, and safe water supply to area residents. The Sewer Department is responsible for 32 miles of sanitary sewer collection lines and six lift stations that transport waste water to the city’s waste water treatment facility. In addition, the city maintains a sewer jetter to service sewer mains and sewer taps. The City is currently developing plans to upgrade its collection lines to improve service. The Wastewater Treatment Department operates a modern state-of-the-art plant that processes 530,000 gallons from the city’s sewer system each day. The plant is composed of a sequencing batch reactor, for biological cleaning of wastewater, an influent solids removal system, two reactors, an aerobic digester, and an equalization basin, plus a centrifuge for sludge/solids removal, two disk filters, and an ultraviolet light unit for disinfection. Solid residue is transported to the county landfill for disposal. Processed and sanitized water is safely redistributed into Jordon Creek. In 2013 the City began contracting with Advanced Disposal Systems to pick-up and dispose of residential and commercial solid waste once each week. The City still maintains two limb trucks that public works employees use to pick up residential yard waste once a week. In 2012 the City transferred the maintenance and repair of its natural gas distribution system to Jointly Owned Gas. As a member of Jointly Owned, the City owns 18% of the Gas Company and shares in the profits from the regional sale of natural gas. The City still manages the customer service functions for natural gas which include requests for installation, service, shut-off, and billing.